Leon Smith's studios and 20 acre sculpture park are located in scenic southern Columbia County in New York -- approximately two hours north of NYC. The large number of varied works in this site are organized into several sections, ranging from classically geometric works in wood, steel and aluminum -- to conceptual works in most imaginative materials such as roof shingles, nylon mesh, logs and wood chips. The studio and sculpture park are open to the public by appointment. 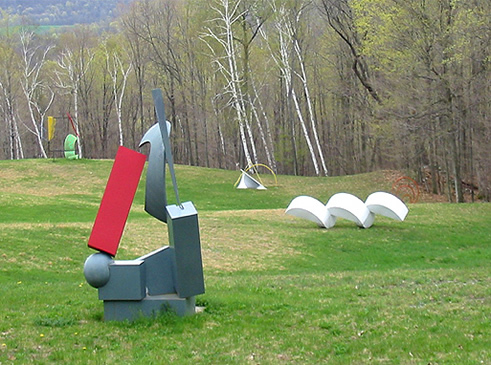 If you wish information regarding pricing, installation or directions to Smith Hill Sculpture Park, please feel free to contact us.